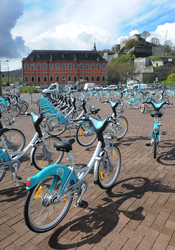 The city of Namur wants to encourage the practice of cycling. It is easy, pleasant and so good for your health and for the environment. The city is laid out to share a territory between everybody and more particularly to welcome the cyclist. Namur has chosen its cycling plan in 2010 and is today recognized as a pilot city for a whole cycle Wallonia. 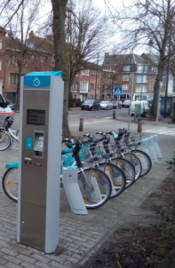 Interesting projects are now on the way : safe cycling links, parking, promotion of cycling…You can discover all the actions on the website of the city « Mobilité de Namur ». But not everybody has its bicycle with him. You can be an inhabitant, a worker, a student or a visitor, Li Bia Velo gives you the opportunity to share this sphere of freedom with many more other cyclists : 240 bicycles are at your disposal in 27 stations you can find in the centre of the city or in Jambes, but also in Salzinnes, Saint-Servais and Bomel. Li Bia Velo, it is « the nice bicycle » in the area of Namur, that’s a nod in the direction of the traditional anthem of the city. Li Bia Velo is also a pleasant manner to live friendly in Namur. One day or every day cyclist, try it. A new App to move around more easily!